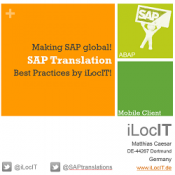 Let us assume that you as a project lead responsible for a set of ABAP packages have to ensure that text elements, such as UI texts, message texts, or F1 help texts, are translated into the correct set of languages. When checking the package properties, you may realize that the translation relevance is not classified correctly for an individual package. The translation relevance determines the translation scope for all development objects in a package and is specified as a package property for each individual package. However, this property is defined when you create a package and cannot be changed in the Package Builder. In such a situation, the translation coordinator needs to change the classification of the translation relevance for the relevant package(s). The following procedure describes step-by-step how you can change (increase) the value for translation relevance of an individual package. 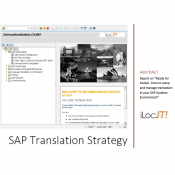 Keep in mind that any changes to the translation relevance of ABAP packages should be carried out by the translation coordinator. Also keep in mind that changing the value for translation-relevance always means extending the translation scope. Reduction of the number of languages for translation must not happen. As a translation coordinator who is going to change the classification for translation relevance, you need the authorization for changing structure packages in the relevant development system. Create an internal message for the SLS-OTS-ACC component if you need to change the classification of the translation relevance. Log in to the relevant development system (original or correction system). Launch the Classification Browser using the transaction code SCLAS . In the selection screen that appears, click the Choose Characteristics button. In the Characteristics dialog, expand the Package Administration node and select the characteristic TRANSLATION_DEPTH. Note This step is not required if you are using transaction STRANSLDEPTH instead of SCLAS . Choose Continue to return to the selection screen of the Classification Browser. Assign the transport request in in the corresponding field on the selection screen. Note You can create a new transport request in the development system using the SE09 transaction. If you are using a correction system for changes, ask the responsible developer for a suitable correction request. On the selection screen, enter the name of the Package in question. Choose (or press F8 ) to execute the classification. Choose on the dialog screen to continue. Note If there is insufficient authorization for changing structure packages, the next information dialog will appear. The Classification Browser now allows you to change the value of the characteristic. In the Translation Depth of Packages: Value field, press F4 . In the value help screen, select the appropriate value and confirm your selection with Continue. Save the new value by clicking the icon from the toolbar. The new value is assigned to the characteristics. The package is now classified with a new value for translation relevance. When you open the properties screen of this package again, you will realize that the new value is assigned to the package. This entry was posted in ABAP, Globalization, Tips&Tricks, Transactions and tagged Packages, SAP translation, SCLAS, STRANSLDEPTH, Translation, Translation-relevance, Translation-Relevance of Packages. Bookmark the permalink.